Cleans everything including sides, and leaves nothing behind. Very easy to remove debris from filter chamber. Curious to see how long it lasts, but an amazing machine ! With its new design and advanced cleaning system, the Nautilus with CleverClean is the new standard in pool cleaning for pools up to 40 feet in length. This upgraded cleaner features CleverClean Technology, a software that systematically scans your pool to determine the most efficient path, regardless of the shape or surface of your pool, resulting in a clean pool every time. The weekly timer function allows the Nautilus with CleverClean to automatically run its programmed two-hour cycle at set intervals throughout the week. Equipped with active brushes, the brushes spin two times the speed of the robot removing stuck-on contaminants from the surface of your pool. The new body style on the Nautilus with CleverClean features a hinged top with quick access to the large filter basket making it easy to clean and ergonomically friendly. This cleaner also has a new fast water release system that quickly removes excess water when removing the cleaner from the pool, ensuring the Nautilus with CleverClean remains lightweight and easy to carry, even after running a full cleaning cycle. Another notable visual difference is the lack of a swivel on the cable on the Nautilus with CleverClean. This is because the Nautilus with CleverClean utilizes software controlled anti-tangling algorithms to prevent the cable from tangling over the course of the cycle. Since all Dolphin Robotics run independently from your pool’s pump and filter system, the Nautilus with CleverClean uses a fraction of the energy when compared to other cleaning systems. 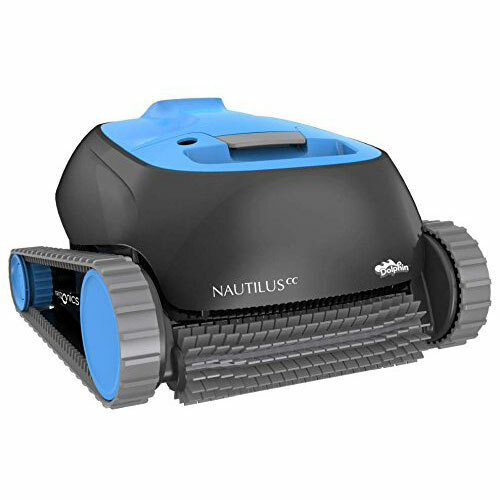 With a 12 month warranty, the Nautilus with CleverClean has everything you need when it comes to a robotic pool cleaner.